Until a month ago, I had never been to Palm Springs. The truth is that it was easy to dismiss the destination since, having grown up in the Midwest, my aversion to desert climate had clouded my view. But on a recent media trip, I got to see what I had been missing all these years. There is a ton of Los Angeles-related history in Palm Springs, and until you see it, you’re missing out on a lot of Angeleno vacationing culture. I’m a bit of a Mid-Century Modern bandwagoner in that I chose furniture and decor of that era to decorate my own space on my most recent move. I love the clean lines, simplicity and functionality – and the desire to create expansiveness of ordinarily small spaces. And while the most obvious pop culture example on TV now is Mad Men, we all remember the recently departed LACMA exhibit, California Design 1930-1965: “Living in a Modern Way” (which I was eager enough to see on a member preview). You can imagine how excited I was to be staying at The Del Marcos Hotel, designed by William F. Cody. It’s the hotel that actually launched his career. It’s a perfectly sized boutique hotel – just 16 rooms – and every room or suite is unique with its own name and well-appointed with era-specific furnishings. 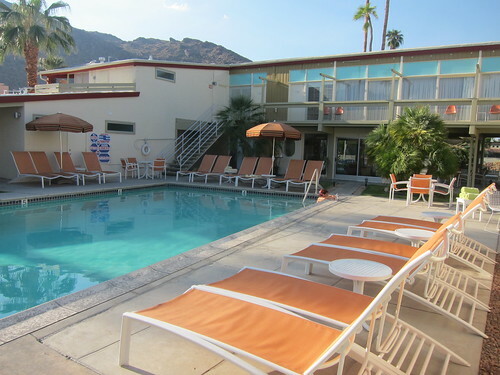 It’s one convenient block away from Downtown Palm Springs, but a perfectly quaint getaway once you enter the glass walled, naturally lit foyer. The centerpiece of the calm courtyard, which enlists a well-curated, period-appropriate soundtrack, is a large, buoyant, salt water pool. There are also plenty of retro-styled bicycles available to ride around town. The place, with all its touches, is absolutely charming. 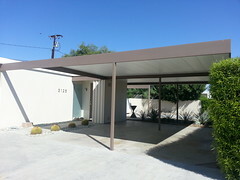 On Sunday, October 7, 2012, Del Marcos is receiving its Class 1 Historic Site Designation – so drop by from 3-5 PM if you plan to visit Palm Springs that day, as light refreshments will be served at the ceremony. Enter your email address to subscribe to e*star LA and receive notifications of new posts by email. Proudly powered by WordPress | Theme: _estarla by roycifer.